Texas to Ohio and back in just 3 days! First off….Yes, we are completely nuts! We have been stockpiling outgrown children clothes and baby items for a few months now. All of this has been taking up room in the Annex, our box trailer. Since we are planning to head farther west this summer instead of going back through Ohio we were faced with the question of whether to pay to ship everything back or deliver it ourselves. If we made the trip ourselves we could also pick up the remaining beef that has been stored in a freezer at Heather’s mom’s house since our visit in May 2016 (when we took delivery of 2 cows from the butcher). So we decided to make a road trip. I only have a limited number of days off between shifts at work, so it would be a speedy cross-country trip. After getting off work at 7am on Thursday we all jumped in the van and pulled out, leaving the truck and RV in Texas. According to Google Maps the trip should have taken us 19.5 hours without stopping, and with stops for fuel and bathrooms we arrived in Mansfield 21.5 hours later. Heather and I traded off driving while the other napped and we drove straight through. The kids were really wanting to see snow while we were in Ohio. We were not sure if they would get their wish or not. On arriving in Mansfield we found small piles of half-melted snow which they were semi-excited about. However, whike we were there the snow began to fall. 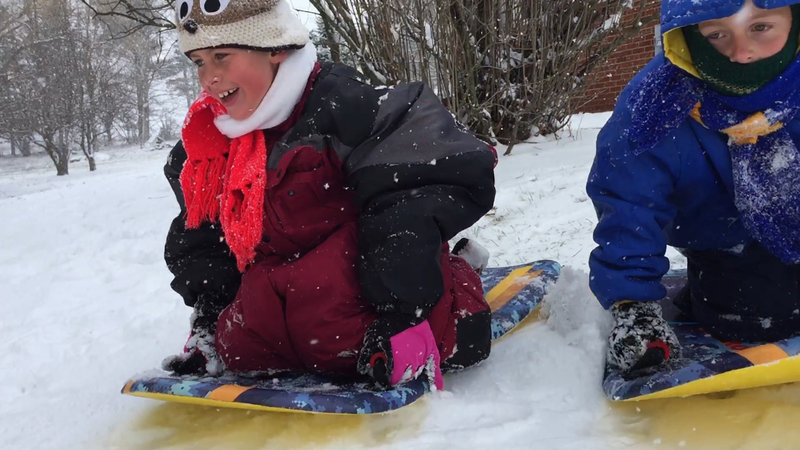 By midday there was a decent blanket of snow and the kids rejoiced as they were able to sled ride down a hill on the farm. They also took the opportunity to eat snow and Bug had a snowball fight with Heather and his grandma. We enjoyed hanging out with Heather’s family for a mere 30 hours before piling back into the van and headed south again. We made a quick stop in Columbus for lunch with some friends before continuing along our journey. We arrived back at the RV around noon on Sunday, and after transferring the frozen beef to our freezer we flopped on our bed for a much needed nap. All-in-all it was a good trip without any snags, but I would not choose to repeat the trip in the near future.